I’ve talked about my love for The Muppets so many times that you’re probably all bored sick of it, but I’ve yet to talk about The Muppets, the new show on ABC. I love it (mostly). The Muppets have always been a mix of slapstick, puns, and adult humor (there’s no better way to explain my humor as well, but that’s my own problem). Like Looney Tunes, if you look at the old shows as an adult, you see jokes that went right over your head as a kid. This show different. In The Muppets, they dropped a lot of the puns and easy jokes and went for more (relatively) sophisticated, character-driven humor. It was unexpected, and I think it turned off a lot of fans. It wasn’t set-up, punch line, exploding fish anymore. In a sense, they’re not “puppets” anymore. They’re characters with real problems and character flaws, not empty joke vehicles. They’ve always been one or two dimensional before: Piggy as the aggressive egomaniac, Fozzy is a hapless comic, Gonzo is the love-stricken weirdo, and Kermit was the hero keeping everyone together. The personalities are still the same, but much more complex. It’s the flaws that are most striking now. Kermit is very manipulative, and at points I cringed at how he handles Piggy. If I have one problem with the show, it’s Kermit’s use of psychological control. Piggy is an unreasonable diva that terrorizes the staff. Fozzy is the engineer of his own downfall. He’s a furry George Costanza. Now it’s the bit players that really carry the show. Pepe, Rizzo and Yolanda are hilarious (and I love how all Muppet rats have old timey NYC accents). The Electric Mayhem is exactly what we always imagined them to be: recovering drug-addled road warriors. Bobo is the everyman (bear) that’s easy to relate to. And Gonzo…it broke my heart to see Gonzo’s online dating experiment go awry. From one weirdo to another, I feel ya, bro. Keep at the online dating, there’s a weirdo out there for everyone. Oh, and how great is Sam the Eagle’s crush on Janis! have Kermit solve problems without underhandedness: Kermit was one of the few three-dimensional characters before the show. We know who he is, don’t stray from that. He’s allowed to have flaws, but being dishonest is very out of character. 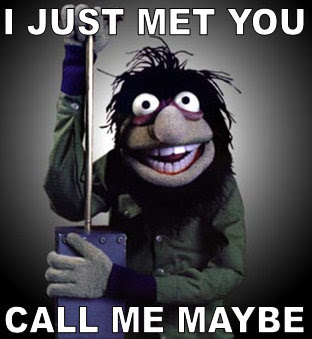 Keep mining the secondary characters: There are so many Muppets. I want to learn more about them. They’ve done a great job of adding depth to them so far. Keep at it. More music: It’s not the Muppets without music, and Piggy is starring in a late-night talk show. Keep adding depth to Piggy. It’s ok to have Piggy as the antagonist, but she’s still beloved. Give us something to empathize with. Other than that, I think the show is on the right track. I hope that it gets renewed, because it’s one of the only shows that I watch. This entry was posted in TV/Movies and tagged fozzy, kermit, muppets, piggy, TV by C. A. Sanders. Bookmark the permalink. Is it weird the muppets scare me?